This handsome pharmacy floor lamp comes with an energy-efficient LED light bulb in a nostalgic Edison style. 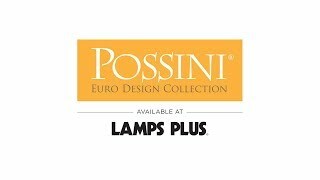 Bring a vintage Mid-Century Modern touch to your home with this pharmacy floor lamp from Possini Euro Design. It comes in a classic brushed nickel finish, with a faux oak accent providing a warm, natural touch. The most noteworthy feature is the wide glass shade, which comes in a chrome plated finish for an eye-catching shine. A stubby solid wood finial on top provides the finishing touch to this charming design. Overall: 64 1/2" high. Base is 13" wide x 1 1/4" high. Shade is 13" wide x 7" high. 55" from floor to bottom of shade. Weighs 18.3 lbs. Standard-medium base socket rated up to 75 watts. Includes one 7 watt LED Edison bulb (2700K color temp; 760 lumens). On-off rotary switch located on the pole. 8' silver cord. Brushed nickel finish over metal construction. Faux oak wood accent on the pole. Chrome plated glass shade with a solid wood finial. Mid-Century Modern pharmacy floor lamp from Possini Euro Design®.